As in Sherwood Anderson’s Winesburg, Ohio, place is at the center of Cynthia Morrison Phoel’s debut collection of linked stories. At once quirky, remote, and agonizingly intimate, the ragged town of Old Mountain is home to a cast of Bulgarian people who do daily battle with the heat or the bitter cold, with soul-crushing poverty, and with petty disagreements among themselves—all the while attempting to adapt to changing times and keep up with their neighbors. 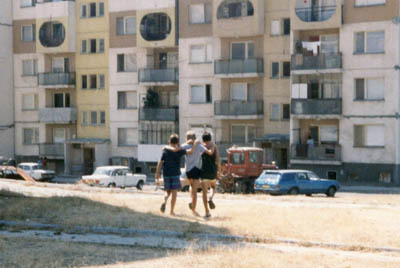 If money is tight in this valley of run-down Communist blocks and crumbling plaster houses, community is tighter still. When a largely unemployed father in “A Good Boy” trades his much-needed summer earnings for a hulking satellite dish, everyone knows about it. The same way everyone knows about the shop lady who rests her finger on the scale to drive up the price of cheese in “Galia.” In “Satisfactory Proof,” a budding mathematician completes a prestigious master’s degree in number theory but fails to recognize the patterns of care and compassion everywhere around him. And in the concluding novella, “Cold Snap,” as the town endures freezing temperatures and waits for the central heat to be turned on, the characters we have already met make a satisfying encore appearance—as the brittle cold pushes them to the edge of reason.